The Ranger R980XR tyre changer features variable high-speed modes that perform masterfully on a wide variety of wheels, including virtually all OEM configurations and performance tyre-and-wheel configurations. Each R980XR tyre changer features the latest in design and wheel service technology, providing the best value and performance in its class. The powerful motor and gearbox work systematically at a controlled speed for easy tyre removal and installation. Ergonomic controls are sensibly placed to minimise excessive reaching, walking or bending, resulting in more jobs per day and increased profits. Large storage trays provide ample space for wheel weights, tools and accessories on this tyre changer. To make tyre changes happen faster for you, we’ve designed each R980XR model with a high-torque electric turntable. They offer faster speeds and reversible direction to keep you moving. By controlling the speeds, your low-profile and run-flat beads have time to relax, all but eliminating the main cause of tyre damage. A powerful pneumatic drop-centre tool dramatically reduces the effort required to change tyres with tougher sidewalls. Operators on these tyre changers can concentrate on working safer and more efficiently. Holds run-flat and low-profile sidewalls in the drop-centre, then follows the bead around as the tyre mounts. A “swing-in” bottom disc can be used to re-loosen stubborn bottom beads or provide lift and support for wide/heavy tyres. We’ve perfectly balanced every flywheel on our tyre changers to eliminate as much vibration and machine component stress as possible. Bilateral pneumatic accelerators offer incredible bead-breaker speeds, even in reverse. The stainless-steel bead-breaker cylinder does not react with moisture in the air, so there’s never a risk of corrosion due to condensation. A multi-axis, adjustable blade allows operators multi-angle tyre capacity, as well as a large, dual-flange axle that completely eliminates blade flex and premature failure. The blade settings can be adjusted according to individual user preferences, a crucial design feature that permits a larger variety of tyre and wheel combos. The bead-breaker ​blade is enhanced with a more rugged box frame that strengthens the integrity of the tyre changer structure, increasing the number of years you’ll be using this one device to change tyres in your shop. A sizeable rubber bump-stop makes returns smoother than ever, reducing shock loading and cylinder wear, as well as wear on other moving parts throughout the life of your tyre changer. The equi-dimensional shape of the hardened alloy steel mount and demount head features a micro-smooth tool head surface that glides tyre beads during mounting and demounting procedures. In addition to the standard alloy-steel mount and demount head, we also include a rugged polymer mount/demount head with adapter that protects fragile tyres and rims from metal-to-metal contact damage. Industrial-grade, 45-micron, pneumatic control valves feature die cast and machined bodies constructed from zinc and aluminium. High-performance polyurethane seals and self-lubricating Teflon® piston guides extend life of the tyre changer and improve overall performance. Valve plungers feature muffled extrication ports that direct any dirt or contamination accumulated on the outside perimeter of the spool to be automatically blown away each time the valve goes into the release position. Ranger’s exclusive RimGuard™ wheel clamps expand up to 762 mm. Made from high-quality hardened steel, the clamps on this tyre changer feature two sets of multi-teeth jaws, internal and external, as well as vertical mounting bolts that let you change tyres quickly. Visual inspections are crucial to proper tyre changer operation. Ranger’s geometric tabletop makes bead lubrication easier, and inspecting those crucial lower beads during mounts and demount is a cinch. Forged steel foot pedal levers can handle heavy-duty operations, no matter how often they’re used. Snap-action springs return the pedal to the neutral position the moment you let go. Your tyre changers need to be extremely responsive, so you don’t accidentally tear a tyre or slow down operations. Features multi-link rod connections for non-binding plunger movement and precise bilateral control. 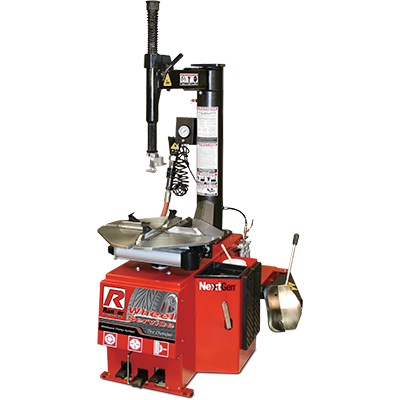 Ranger Next Gen™ tyre changers feature high-pressure polyurethane pneumatic tubing. The tubing is equipped with a seamless bore for better flow rates, high abrasion resistance, high burst tolerance and maximum kink resistance. The TurboBlast™ bead seating system, found exclusively on Ranger tyre changers, forces air to help seat stubborn beads. Using a powerful blast from an attached hose, the non-marring nylon discharge barrel features a contoured tab that locks securely on the edge of the rim for better control during air discharge between the tyre and wheel. A welded-steel, eight-gallon surge tank is ready at all times for heavy-duty use and extremely fast charge times. To keep your shop running as efficiently as possible, we include a range of wheel service accessories to accompany your tyre changer. Necessary items, like a soap bucket and brush, plastic wheel protector kit with turntable jaw covers, bead-breaker blade boots and specialised mount/demount head covers will make your shop life that much better. A hardened steel tyre iron and bead lever tool is included to assist with even the most stubborn tyre change operations. Not to overlook even the smallest details, Ranger tyre changers are completely sealed to protect all main-lead electrical terminals, auxiliary switches and motor enclosures. No dust or other contaminant can clog or damage the terminal leads. It’s just one less thing for you to worry about when you choose Ranger for your shop’s tyre changer. The drive-belt on the R980XR has convex sidewalls that evenly distribute wear. The drive-belt also provides belt support, letting your tyre changer operate at full efficiency for years to come. Flex-bonded cords and flex-weave covers reliably fend off attacks by oil, heat, age, etc. A 45 mm spring-assisted hexagonal vertical tool shaft and hardened-steel horizontal outrigger support arm maintain perfect position of the mount-demount tool head during all tyre service procedures, greatly reducing the chance of tyre damage. An easily accessed, pedal-activated tyre inflator immediately starts inflating tyres when the ergonomically placed foot pedal is depressed. Meanwhile, a sure-grip clip-on valve chuck is attached directly to the inflation hose, permitting operators to inflate tyres without ever using their hands, and an air pressure dump valve is integrated into the structure of the tyre changer itself, enabling you to lower tyre pressure with just the push of a button. This sophisticated design makes Ranger tyre changers easy to operate in the most intense shop environments. Changing motorcycle tyres? No problem. Ranger’s R980XR tyre changer fits an optional motorcycle clamp, sold separately. The more clients you service, the more you add to your bottom line and the happier you’ll be.